Ulta Beauty is a mid-range to high-end grouping of cosmetics and beauty supply stores, each of which has a salon included. With over 1,100 stores currently located around the United States, Ulta is a growing brand that appeals to customers who want premium services in a more luxurious environment than they might find at other lower-tier chains. Ulta Salon prices start at about $38 for an adult haircut and $20 for a kids haircut. 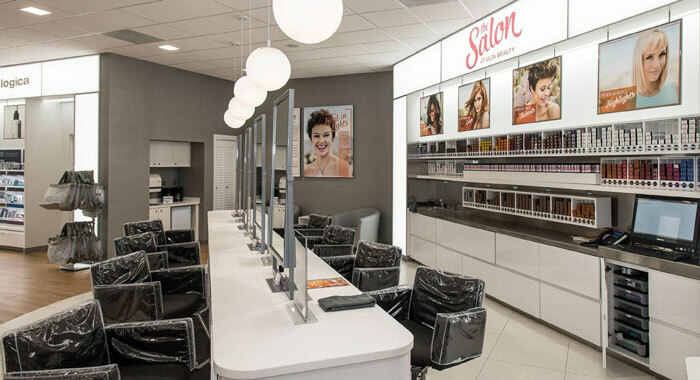 Each Ulta Salon is located within an Ulta Beauty store and usually takes up 10 percent of the space. Therefore, customers can get their beauty shopping done while they also get their hair cut and styled. Each store is clean and well-lit and carries a variety of mid-range and premium brands for makeup, fragrance, skin care, hair care and more. This one-stop shopping and service format appeals to many adults who are busy and who do not have the time to travel around town. Ulta is also known for its amazing stylists. Because of the slightly higher prices than can be expected at other lower-end salons, stylists have plenty of time for full consultations with their clients. They can take the time to discuss cuts, styles, hair care and colors to give a truly personalized experience. Ultamate Rewards also make purchasing products and services at Ulta a wise decision. Points eventually add up to great rewards and free beauty products. Skin care appointments can include face mapping with a skin therapist who will teach clients how to best care for their skin. Facials and microdermabrasion are other great solutions for such skin concerns as oiliness and aging. At the brow bar, customers can get brow or facial waxing, brow tinting and lash extensions for natural or full brows. Nail care is done with OPI gel colors. All haircuts include shampoo, conditioner, scalp massage, and blowdry unless otherwise states. Haircut using clippers for an ultra-short design. Haircut, trim, or shape with customized deep conditioning treatment. All color services include shampoo, conditioner, scalp massage, and blowdry. An all-over application of a single hair color from roots to ends. Achieve a multi-dimensional effect with an all-over application of multiple colors. Add shine & tone with an all-over color application of demi-permanent hair color. An application of hair color to the root area only. Foil or balayage highlights on a small area of the head (up to 10 foils). Foil or balayage highlights on half the head. Foil or balayage highlights on entire head. Soften the contrast between natural hair color at the root area during or between a highlighting service. An all-over or root touch-up application of lightener to achieve the perfect shade of blonde. A mini root retouch focused on the front hairline and part line areas only. An all-over color application of Redken for Men Color Camo to blend gray hair. Includes any and all color services needed to correct and complete the desired look. Charged in half-hour increments. All texture services include shampoo, conditioner, and blow dry. Reduce curl and frizz with a smoothing treatment powered by Keratin Complex to provide temporary curl and frizz reduction for up to 12 weeks. Add curl to hair with a permanent wave. An all-over or retouch application of relaxer to permanently straighten the hair. A texture wave, relaxer or keratin treatment on a specific area of the head, such as the bang or nape area. All styling includes shampoo, conditioner, and scalp massage unless otherwise stated. Curl or straighten the hair by use of a flat iron, curling iron or wand on dry hair. Shampoo, conditioner and blow dry not included. Achieve the style of your choice along with a shampoo, conditioner, scalp massage and customized blow dry. Smooth the hair by means of drying/wrapping and pressing smooth with a pressing comb and/or flat iron. Shampoo, conditioner, scalp massage and blow dry included. Event styling that includes any combination of curls, twists, pin-ups or braids on dry hair. Shampoo, conditioner and blow dry not included. Advanced styling methods such as full head braids charged in half-hour increments. Shampoo, conditioner, scalp massage and blow dry not included. Removes unwanted product and mineral buildup such as chlorine. Turn back time with a professional restoration service for damaged hair. Redken Heatcure harnesses the power of heat to allow the unique treatment formula to penetrate deep into the cuticle of the hair to restore the hair's healthy look and feel. Prevent damage and protect your hair during a color service (Redken pH-Bonder). Two of our most popular treatments combined for Ulta-mate hair health. Featuring an Anti-Damage Color Additive and our Damanged Hair Restorative Treatment. Set up a consultation to let our experts help you determine the best extensions for your hair. Whether you are looking to add volume, length or hair color,the possibilities are endless! Your quick fix for flawless skin featuring the latest skincare products and trends. Customized skin solutions to be blemish free, reduce wrinkles or achieve a luminous glow. Indulge a little longer with this customizable treatment designed to solve your top skin concerns. Fueled by ProPower Technology - Customized and powerful chemical exfoliation designed to brighten, refine tone, reduce blemishes and reveal your healthiest skin. A safer,more natural method of microdermabrasion powered by DermaRadiance and natural flower grains of rose, lavendar and tea tree. Personalized facials include deep cleansing, exfoliation and intense hydration for visible results. Designed for all skin conditions, your licensed skin therapist will customize the treatment just for you. Our 90 Min. Customized Facial enhanced with your choice of Microdermabrasion for Smoother Skin, or a relaxing Hand or Eye Treatment to Revitalize. Complete your service with this quick touch up or pop in and meet with an available service professional or retail beauty advisor to try something new. This informative and interactive hands on experience is designed to educate you to achieve the look you've always wanted such as the perfect smoky eye. Put your fresh face forward. This make up application will have you looking your best. A make up application that includes enhanced make up techniques for a more dramatic look for those special moments...whether you are attending prom, walking the red carpet, or walking down the aisle. Add on strip lashes for $10. Lashes in a flash! We'll apply your same-day purchase of lash strips for a quick and temporary lash enhancement. For a longer-lasting look, we'll apply your same-day purchase of semi-permanent flair or cluster lashes across the eyelid. This does not include any application of permanent lash extensions. Lightweight and long-lasting, this look will keep you coming back for more. Keep your lashes looking their best with a quick refresh to fill any spots where the eyelashes have shed. For optimal results, we recommend every 2 weeks. Professional removal of permanent eyelash extensions. It is not just hair care products that customers can buy at Ulta once their salon appointments are completed. Ulta offers a full range of cosmetics, fragrances, skin care products, hair care products and beauty tools from a wide range of brands at every location. Whether customers are looking for gifts or for new colors for the season, Ulta has nearly anything one could think of for bath, body and beauty. All products can also be purchased online. Ulta Beauty offers many popular brands, including the ever-popular MAC Cosmetics. Other favorites include NYX, Urban Decay, Clinique, Tarte and Biosilk. Ulta also sells its own line, known as the Ulta Beauty Collection, which includes products in the makeup, nail care, skin care, hair care, fragrance and bath and body lines. Bestsellers include their makeup brushes, lip oils, hair smoothies and brow tints. Ulta Salons began in 1990 when Richard E. George launched the original Ulta Beauty brand. Since then, many of the chief operative officers have changed, but the mission and look of the brand and store style has remained consistent. Today, it still reflects the founder’s original dream, which was to be able to offer both high-end and low-end products in the same store. Today, there are over 1,100 Ulta Beauty stores located in 49 states as well as the District of Columbia. Each store has a salon that offers a full array of personalized hair and beauty experiences. The more than 21,000 employees include numerous educated and experienced stylists who provide premium services in the open salon environment. Ulta Beauty has been a publicly traded company for years with over 4 billion in revenue each year. It remains a strong presence in the salon business and is especially strong along the East Coast and in California where a majority of its locations are situated. However, its headquarters remain located in Illinois where the current COO, Carb Rubin, is known as one of the highest paid individuals in the Chicago area.